The capabilities to explore biochemical substrates and chemical dynamics, as well as cation regional gradients, oxygen metabolism and brain structures at the 50 μm level in the human brain have prompted a program of design and planning with a team of 28 researchers including magnet and magnetic resonance hardware engineers and physicists; biophysicists, chemists, inverse problem scientists, and researchers experienced in magnetic field health effects and safety. The study is a response to a National Research Council Report recommendation and is the subject of an NIH application for planning imaging systems, which will allow new studies of the brain. Lead Co-investigators include Dr. Mark Bird and Dr. Lucio Frydman, National High Magnetic Field Lab, Tallahassee, FL and Dr. Joanna Long, Univ. of Florida Gainesville, FL. 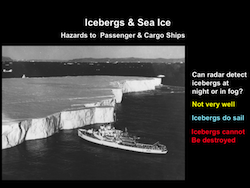 This research is a revisit of work done in 1959 under orders from the Commandant of the U.S. Coast Guard to evaluate methods of detecting icebergs by remote sensing. During the impingement of icebergs on the North Atlantic shipping lanes and elsewhere, reports of collisions with icebergs in spite of the modern radar systems led the International ice Patrol to launch an investigation of the reasons radar might not be dependable. Budinger determined that cold iceberg ice had a very low dielectric coefficient (3.05) as inferred by radar measurements at sea on 90 icebergs. The revisit is a confirmation of these data along with the data on the magnitude of wind effect on iceberg drift trajectories. As maritime activities increase in the Arctic Ocean and waterways of Canadian Territories, ships and drilling platforms are jeopardy from drifting icebergs and ice floes whose detection and drift trajectories are not well understood. The goal of this work is to define the sea surface and atmospheric temperature conditions on which detection depends and to propose guidance rules for navigation in poor visibility conditions. make this system available to a large number of research and clinical sites without the added investment in an on-site cyclotron, equipment, and personnel. This project is with Dr. James O’Neil for chemistry and Dr. Grant Gullberg for animal studies. This project explores the hypothesis that the pituitary receives pressure stresses greater than other brain tissues due to the bone tissue architecture and differences in the speed of pressure stresses between bone and brain tissues. Experimental work includes mapping pressure distributions with sensors after blunt trauma at different stress rates and computational simulations with a high fidelity tissue and bone model in collaboration with the MIT group of Dr. Raul Radovitzky and the computational center at the Lawrence Berkeley National Laboratory. Co-investigator is Paul Lum of University of California, Berkeley.